Hi, my name is Gail or" Miss Gail" to my students. I taught second grade for seven years and have been tutoring elementary children for the last fifteen years. I have a college degree in Elementary Education and a Master Of Science Degree in Early Childhood Education from Northern Illinois University. I specialize in tutoring children from pre-K through fourth grade. I have a fully equipped classroom in my home with many reading and math programs. I live on a five acre farm with three horses who love to greet and interact with the children. They are my four-legged inspiration to get children wanting to return. 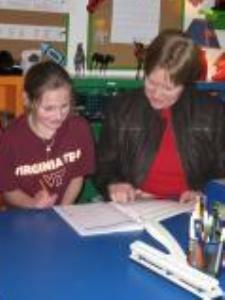 My Star Elementary Tutoring business was featured in The Northern Virginia Daily Newspaper in 2006. My goals for tutoring are to provide positive reinforcement to help children build self confidence, experience the feeling of success, receive rewards for achievement and effort, learn to set goals and enjoy the process of learning. I give one hour private lessons in my home classroom. Parents may observe the lesson if they wish, relax downstairs within listening range, or sit out on the porch. I am always happy to coordinate with the student's teacher if needed. I graduated from Ripon College with a degree in Art and Elementary Education. I have a Master of Science Degree in Early Childhood Education from Northern Illinois University and I have seven years of classroom experience as a second grade teacher. I have been tutoring pre-k through third grade for the past eight years in a fully-equipped classroom from my home. I put the greatest emphasis on reading and math. I can, however, help with any elementary subject as needed. I teach a combination approach of phonics and sight words for reading. In both reading and math, I use a building block approach starting with a thorough understanding of basics. My goals are to build self confidence by promoting successful experiences. Children earn rewards for achievement and effort. They learn to set goals for themselves and enjoy the process of learning. Math can be a struggle for many elementary age children. Today, theory has become an important part of learning math. It is at this early learning stage that a strong base of understanding numbers and how they relate to each other needs to be acquired. I always keep learning fun with lots of rewards to build on the learning experience. Phonics teaches children the connection between letters and sounds. Children who have a good background in phonics are given the skills to become strong readers, spellers and writers. Taught in a systematic way, children will learn to decode words for pronunciation and understand the variations of sounds in the English language. I strongly incorporate phonics in my teaching of children who are struggling in reading and spelling. These basic teachings in phonics will help young learners throughout their educational experience. Reading is the most important subject for a child to learn. It is the basis of learning for all other subjects. If children develop a good reading background, they have a foundation that will help them in every other aspect of their leaarning experience. I teach a balance of phonics and sight words. I think learning to read should be a fun experience and motivate children to want to read on their own. Teaching children to read is a passion for me. A strong background in language arts is the most important gift you can give a child for future success in school and beyond. I also struggled with spelling in elementary school and appreciate the frustrations it can cause for a child trying their best to succeed in their school studies. I will create fun and effective methods to help a child improve their spelling skills and build their self confidence. My greatest passion in teaching children is to give them a sound base that will help them build their educational skills. A solid and growing vocabulary gives children the confidence to expand their skills in reading and all subjects. She rescued our year!!! Our hero! Ms. Gail tutors my two daughters, 2nd & 3rd grade, twice weekly for one hour each. Both girls are visually impaired and have Auditory Processing Disorder. This combination has them both reading 1-2 years below grade level. Their frustration with reading and/or school was growing. We had become accustomed to sub-par report cards despite how hard my daughters worked. We began working with Ms. Gail the first week of school. She works with the girls not only on current assignments and homework but with a focus on reading. For the FIRST TIME ever the girls brought home A-B report cards!!! I am seeing tangible proof of reading progress as well as the girls overall desire to attempt reading on their own time (a former battle!). Ms. Gail is wonderful with the girls. She is firm but gentle, and always smiling. My girls have very different learning styles and Ms. Gail works well with both. She is able to keep my youngest on task and interested while keeping my oldest encouraged with minimized frustration. She is very communicative with ideas and has really listened to me as a parent of "unique learners." Ms. Gail's experience within the classroom is obvious and a true asset. We were very fortunate to find Ms. Gail as a tutor. I cannot speak more highly of her and recommend her with highest praise. I foresee a long academic relationship with her! Thank you Gail for helping my daughters discover the joy of reading! Ms. Gail began seeing our son Tyler earlier this year for help with reading. She sat down with us and explained what she would be doing and has always encouraged us to be a part of the process. We started noticing improvement in his grades and confidence right away. Tyler loves her and looks forward to his sessions with her. Her home classroom is very inviting and she makes each lesson fun and enjoyable for the kids. I would highly recommend Ms. Gail to anyone looking for a high quality tutor. Her extensive knowledge of elementary education and extreme patience made her the perfect tutor for our son. Gail spent today's lesson evaluating Jessa's strengths and noting any recognized weaknesses. She kept Jessa engaged in the activities and immediately brought her back to attend as needed. Gail and Jessa's Mom spent some time discussing topics to focus on during the summer. As a rising third-grader, Jessa's Mom wants to extend her reading across the curriculum, enhance her vocabulary and story writing skills with math reinforcement as time permits. Jessa is looking forward to her next lesson with Gail. Ms. Gail it was a pleasure write a review in WyzAnt/tutoring. I just want to thank you for the excellent work you have done with Logan. We look forward to seeing you again soon. Ms. Gail has made great progress with our son, Logan. Ms. Gail goes above and beyond being a tutor for our son, she also attends several meets with us and his teachers to help Logan improve his reading and mathematics skills. It is a pleasure to hear Logan ask if he is going to see Ms. Gail today. She is excellent and I would recommend her to anyone in the area looking for a tutor to help their son or daughter. I know we will continue using Ms. Gail. Gail absolutely changed my child's life for the better. Not only did she improve his learning in all subjects, she helped him to become more independent and confident. She is very patient and caring. We both enjoyed and appreciated her very much!!!! Thanks for everything!! Gail has been a wonderful tutor to my son. Her tutoring room is imaginative and inviting. She is very encouraging and patient. My son has improved tremendously. Gail listens to what my son needs & provides lessons based on how he is doing in school. I could not ask for a better tutor. She has a classroom for her students & a comfortable area for the parent to wait within earshot. My son loves working with her! I can not say enough positive things about Ms. Gail! My daughter loves working with Ms. Gail and always looks forward to her sessions with her! Gail has a wonderful, child-friendly, fully stocked classroom in her home. We were always very comfortable waiting during our tutoring visits-you can sit in the classroom and observe or you can sit in another room and read/watch TV. Gail is excellent with communication and we always knew what they worked on and she reviewed our daughters progress with us. If you are looking for a caring, patient and experienced tutor for your child I would recommend giving Gail a try. You won't be disappointed! Best thing we have done to help our daughter. After the first visit we knew we had done the right thing. Mrs. Gail C was very patient and thorough during the first evaluation session. Our daughter looks forward to each of her tutor session and always leaves with a huge smile on her face. Since the first visit we have seen the grades of our daughter go up and her confidence level improve. I would recommend Mrs. Gail C. to anyone who has a child that has struggled in school.